"I got this recipe from my cousin and now this is my favorite dish. The ranch dressing mix adds nice flavor." Melt the butter in a large skillet over medium-high heat. Stir in the chicken and cook until no longer pink in the center, about 7 minutes. Whisk together the condensed cream of chicken soup, sour cream, chiles, and ranch dressing in a bowl; spread a thin layer of the mixture into a 9x13 inch baking dish. Spoon about 2 tablespoons of sauce into each tortilla; divide the chicken among the tortillas and sprinkle with 3/4 of the cheese. Roll the tortillas into cylinders and place seam-side-down into the baking dish. Pour the remaining sauce over the enchiladas and cover the dish with aluminum foil. Bake in the preheated oven until hot, about 35 minutes. 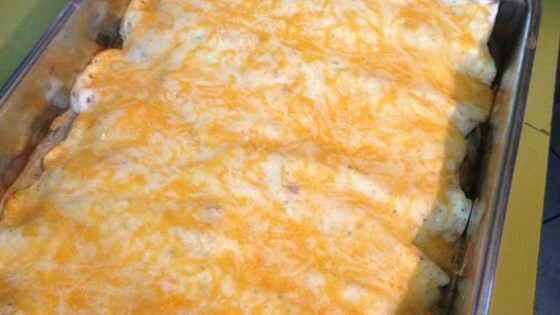 Remove the foil and sprinkle with the remaining cheese. Return to the oven and cook a few more minutes until the cheese melts. These were fantastic! I made exactly as directed, but added onions. So good and even my picky eater gobbled them up! Thanks for the recipe! I made these the other night and everyone loved them. Am making them again tonight for company. I did add a little garlic to the sauce. Left out chilies. This was AWESOME!! Sauce (with only 8 oz sour cream) is awesome! Add a teaspoon or so of chipotle chile powder, can't go wrong!